I’ve been following Waukesha’s water woes for more than a decade, and in my former capacity as executive director of Milwaukee Riverkeeper I was on the front lines of the coalition that helped to pass a strong Great Lakes Compact. However, after leaving that role in late 2008 to refocus on national water matters, I’ve been on the sidelines, observing the Waukesha water skirmishes from a distance. This week, with the deadline for public comments nearing, it’s time for me to weigh back in. During the three packed public hearings held earlier this week there were many well-researched remarks on the legality of the request, the impact to Lake Michigan, pollution loads for the Root River which would receive the sewage effluent, and whether or not Waukesha has been aggressive enough with its required conservation strategy. These are all valid points that have been well covered. Instead, the point I’d like to argue is that there is a high risk that the proposed $207 million pipeline could become a white elephant, saddling Waukesha residents with an expensive, inflexible and quickly outdated solution. Being beholden to outdated public works is like being upside-down on one’s mortgage, but worse since there is little chance that the market value would return. My concern is based on three intersecting lines of thought. The first is that if Waukesha leaders follow through on their proposal to build a pipeline and the required return flow, its citizens will be locked into an expensive, inflexible, super-sized option that they will need to continue to live with, and pay for, as the decades pass. If I lived in Waukesha I’d want to know what types of bonds would be used to pay for the construction, how those bonds are going to be paid off (property tax? revenue from water sales? ), what assumptions are behind the revenue predictions (increased population? steady water use?) and who will be liable if there are challenges meeting those revenues. While it’s highly unusual and unlikely, it’s not unheard of for a community to be forced into bankruptcy because predicted water revenue never materialized. in many U.S. communities, documented that it was seeing this trend throughout its service communities. For the households it served it saw a roughly 15% reduction per user over the decade leading up to 2013. Keep in mind that these communities were not necessarily trying to incentivize conservation, but it happened anyway. 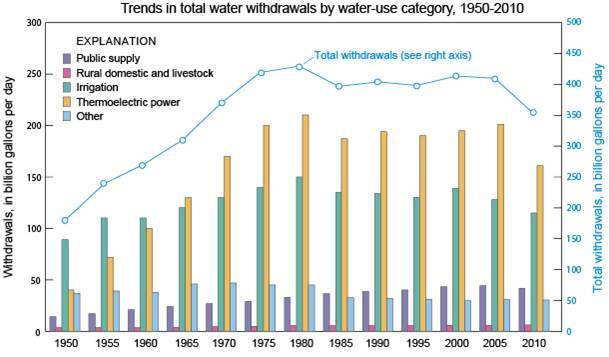 Even Waukesha has experienced significant declines in water use in recent years. More importantly, these trends are projected to continue into the future. Even without local incentives, appliances are becoming more and more efficient, so that even without changing ones habits water use is predicted to decline. I recall a conversation with a plumbing manufacturer’s representative who told me “Lynn, we’re not making two different sets of fixtures. If California wants water-efficient fixtures, that’s what we’re making for everyone.” Contrast that with Waukesha’s projections that water demand will continue to increase over the next decades. Third, technology is changing rapidly. I was saying that six years ago, but with rolling droughts throughout the southern and western United States, not to mention concerns in other parts of the world, and growing concern over climate change and resource availability, it seems that every day there is a new technology coming on line that brings down the price for removing contaminants from water, for recovering water from waste streams, and for capturing rainwater on site for future re-use. Equally exciting is that the technologies are becoming available at smaller and smaller scales. San Francisco is now requiring that new buildings over a certain size treat and re-use waste water on-site, a move that will catalyze innovation and increase the availability of these technologies in other parts of the country. This is a critical point because the down-scaling of water technologies gives customers new options. In the past water utilities have had a monopoly on the water supply, but we are moving to a day when customers can take matters into their own hands. Actually, simple conservation and the resurgence of old practices like rain barrels for outdoor use are already ways that customers are taking business away from water utilities. But as options become more sophisticated, easier to use, and more affordable, it is likely to continue to erode at water utility’s traditional business. This is very much like what rooftop solar collectors are doing to the energy utility business. Some utilities have embraced it, but in regions that are heavily invested in large coal-burning power plants, the utilities generally feel pinched by the growth of the new technology. So if you put all three of these things together – a large, inflexible investment, more efficient appliances and declining use, and new technologies that erode the utility monopoly – you have a perfect storm, or what some would call the utility revenue “death spiral”. 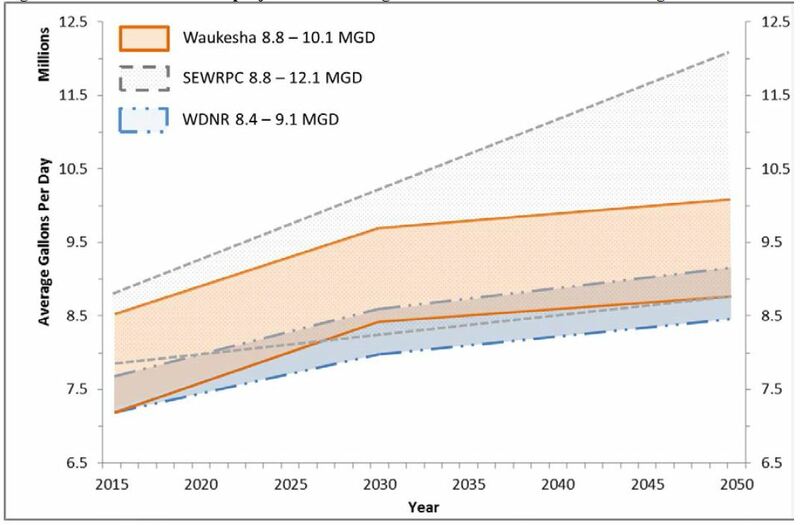 That, of course, is the extreme scenario, but it illustrates the general point that Waukesha’s decision is not just about legal matters and Lake Michigan impacts. It is facing a very real business decision that, I would argue, makes no sense as one looks into the future. But don’t just take it from me. 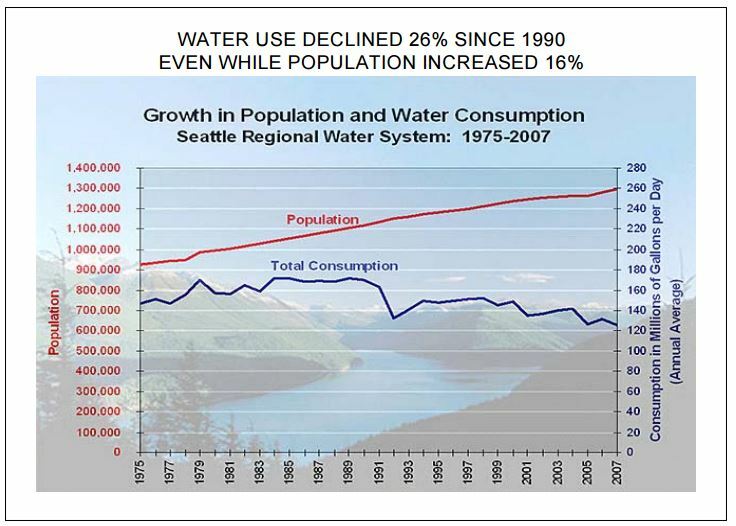 Green Biz recently published a piece on declining water use. Jeff Hughes, a nationally respected expert on water financing and director of the Environmental Finance Center at the University of North Carolina, recently wrote a piece entitled “Five Dangerous Myths for Small Water Systems”. Myth 3, “Build it and they will come” and Myth 4, “You can predict the future by looking at the past” are especially applicable to Waukesha. This isn’t the first time I’ve weighed in on the Waukesha matter, and certainly won’t be the last. Waukesha should not put all of its eggs into a single basket. Times have changed since it first started facing its over-drawn water supply, and so have the alternatives that are available to it. Unfortunately, for the last ten years the city has been looking backward, at old projections and old technologies. If I lived in Waukesha, I’d want my city to be looking toward the future with new ideas, and realistic expectations for the uncertainties ahead. rooms, so when planning my trip to the Western Power Summit in Las Vegas last fall I booked an early morning flight in order to have time to visit Hoover Dam. Being an icon of all things water and power, it seemed a fitting addition to my trip. Besides, “enrichment” activities are of the perquisites of being one’s own boss. A few weeks ago, Shadi Eskaf if the University of North Carolina’s Environmental Finance Center posted a series of two blogs on his household water use. The first simply showed the data from his bi-monthly water bill, graphed out across the years, and prompted readers to use the water data to make inferences about his family’s water use. People really gave it some thought – it’s one of the few times I’ve seen constructive dialogue in response to a blog post! We’ve lived in our house nearly fifteen years, which is the exact amount of time that I’ve wanted to make our driveway smaller and my garden larger. Previous owners expanded the driveway to make for better basketball, something my sons appreciated when we first arrived. But given that the driveway is in the sunniest portion of our Wisconsin yard, through the years I’ve been slowly encroaching on that space with an expanding array of planters. 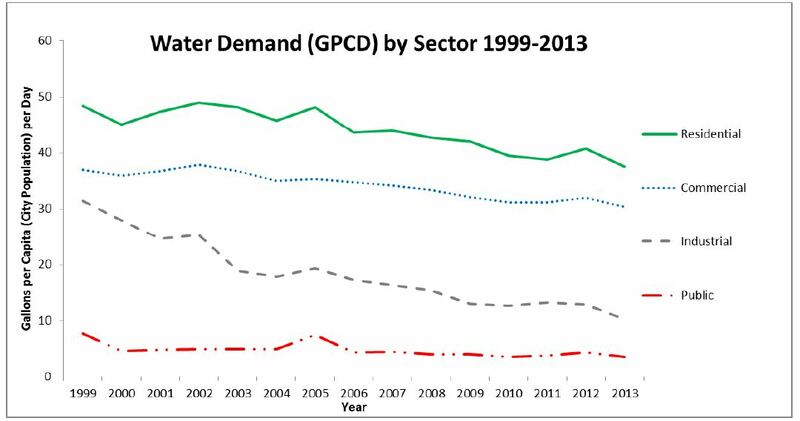 No one needs to tell the water sector that, “Times they are a-changing”. Whether it’s increased storm intensity, prolonged drought, saltwater intrusion, or disappearing aquifers, no region is unaffected by change. Add to that maintenance backlogs, a dynamic regulatory environment, declining revenues, and an aging workforce, and it’s easy to feel like the future is about as predictable as a ride on the Tilt-A-Whirl at the state fair. Last Friday I, along with about a dozen others affiliated with The Nelson Institute for Environmental Studies at the University of Wisconsin-Madison, was treated to a tour of some of Madison’s stormwater control projects, hosted by Greg Fries, the principle engineer for the City of Madison’s Storm and Sanitary Sewer Section. I’ve seen a lot of rain gardens in my day, but I was especially interested in hearing from Greg and seeing Madison’s projects. For me, one of the most interesting aspects of our tour was to see stormwater management through the eyes of a city that takes it seriously. Madison is surrounded by freshwater lakes that, like so many others, have been plagued by excessive phosphorus and the resulting cyanobacteria (“toxic algae”) blooms. Whereas a city like Milwaukee, which still has a combined sewer, looks to rain gardens and green infrastructure primarily to decrease stormwater volumes, Madison, which has a separated sewer, is primarily focused on infiltrating stormwater into the ground where it can be naturally scrubbed of phosphorus and other pollutants before entering area streams and lakes. The city started building rain gardens well over a decade ago and has taken pains to document its costs, techniques and results. Greg told us that, early on, the incremental cost of building a rain garden in the public right-of-way along the edge of a city street was about $20,000. Much of this cost was attributed to the hugely time-intensive effort of working with community members to explain the project’s goals, allowing them to have input into the design, and listening to their concerns. In addition, because they were new at the business of designing, building and maintaining the gardens, the first attempts were over-designed, with redundancies that added to the cost. Today the process is much simpler, and is only a tiny fraction of that initial cost. When the city is ready to install a rain garden, it simply sends the adjacent homeowner a letter alerting them to the upcoming construction and asking them to select from a template of styles. Rather than having to convince homeowners to accept a rain garden, Greg now has the opposite challenge: Homeowners are calling his office wanting to know when they’ll be getting “their” rain garden. I was especially excited to learn that Madison’s stormwater team has made it a practice to work closely with their colleagues who have responsibility for streets. Rather than have separate planning and construction processes, Greg’s team studies the city’s list of streets that are scheduled for reconstruction and focuses their rain garden installations on those streets. By piggy-backing on the street work and merging the construction contracts, the city saves valuable time and money. This is the exact recommendation that I’ve been hearing for years and years, but very few cities actually put this simple step into action. It allows them to move much faster, and in fact this small city now has hundreds of rain gardens in place. Greg also shared with us a USGS study published in 2010 based on Madison rain gardens. The study was designed to put some solid data behind the twin questions of whether species composition matters, and whether soil type matters in rain garden design. You can read the study for yourself, but the answer boils down to “yes.” Having porous soils that include ample sand increases infiltration rates over those that have an impeding clay layer. That’s probably not very surprising, but it’s good to have data. They also showed that native prairie plants, with their deep roots, doubled or even quadrupled the water infiltration rates compared with gardens planted in turf grass. Root structure really does make a difference. Turf grasses have fairly shallow roots; examination showed that their roots did not go through the clay layer. Native prairie species, on the other hand, had deep roots that grew straight through the clay, creating micro-channels for water to seep through. And, of course, they are much prettier than turf! Never ones to rest, Madison is now teaming up with USGS to study leaf management. When leaves fall into the street or, heaven forbid, are raked into the street, fall rains leach phosphorus from the leaves and carry it along to the storm drain and straight to the lakes. They are testing a wide variety of methods to see which will work best for keeping phosphorus in the ground and out of the water. I’ll have to check back in a year or two to see what they’ve learned! This is my final blog posting on The Johnson Foundation’s site, under the banner of “On the Waterfront.” However, you can join me over at Broadview Collaborative, Inc where I will continue blogging on the sustainability questions on the top of my mind. After a brief hiatus my next post will be on a 2MW biogas facility that is being privately operated right in the heart of Milwaukee. I hope to you’ll stay in touch!